Clock by KHS is a digital seven-segment 24-hour clock. 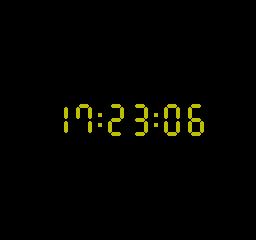 Set the time with arrows, toggle between NTSC and PAL with A button, toggle the visibility of unlit segments with B, and press start to start the clock. The clock should be more accurate than exactly 50 (PAL) or 60 (NTSC) frames per second.